← Corporate Image Apparel, Inc. Check out some of these hot deals we have going on for the summer time. All offers end on July 31st, so act fast! 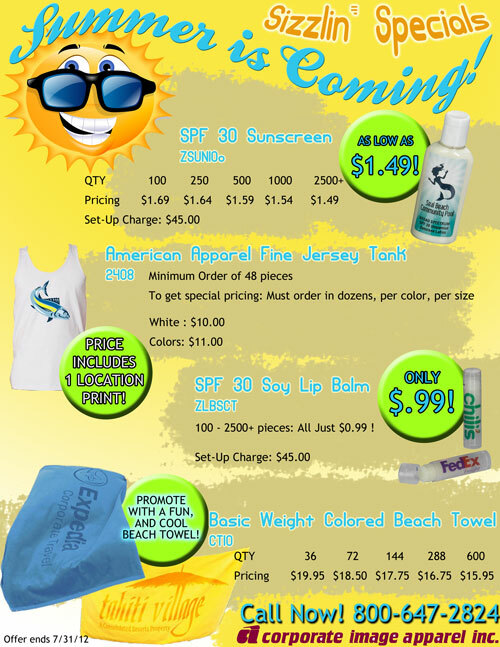 These are great ways to promote your brand in the summer time. Everyone uses sunblock at the beach! What a perfect way to put your name out there. Everyone loves freebies. The SPF lip balm is a great giveaway in the summer. Your prospective customers will be protected from the sun and be reminded of your company everytime they swipe their lips! Who doesn’t wear tanks in the summer?! They are a great way to keep cool and have your companies logo put out there for everyone to see! Towels at the beach are a necessity. Put your logo on a bright, colorful towel for your prospective customers to use while they bask in the sun! Call 1.800.647.2824 for more information on these hot deals! This entry was posted in E-mail Blast, Uncategorized and tagged ciainc, corporate image apparel, email blast. Bookmark the permalink.